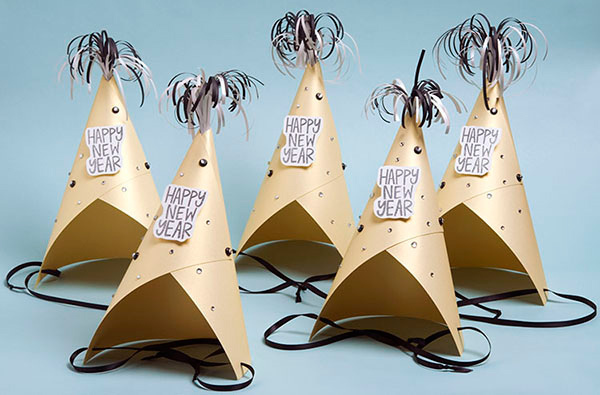 If you’re having a New Years party or are looking for New Years activities for your family, you must make these glittery gold New Years party hats! CBS 2 Chicago (click to view) even featured them as a fun way to get kids involved at New Years. You could, of course, use this party hat design in different colors with different stamped messages for other celebratory occasions! 1. Cut one 4″ strip of super tacky tape. Apply to upper left corner of Shimmer Gold cover paper as shown (see A in PDF) and set aside. 2. Using scissors or guillotine trimmer, create fringe topper by cutting one sheet each of Shimmer Silver and Black text paper in half widthwise. Make fringe cuts along 8 1/2″ side approximately 1/8″ apart, making sure to leave approximately 2″ uncut at opposite end for rolling (B). Roll fringed paper around pencil tightly, secure with tape and remove pencil. Curl fringe with bone folder. Center fringed tube on the sheet of 8 1/2 x 11″ Shimmer Gold cover paper that was prepped with tape earlier (C). Form cone shape, then unpeel super tape backing and press firmly to temporarily hold in place (D). 3. Cone needs to be permanently secured with brads. Do this by making small holes with an xacto knife where indicated (E). Insert brads into holes and fasten in place. 4. Stamp “Happy New Year” onto Eco-White cover paper with VersaMark inkpad. Sprinkle with Metallic Silver embossing powder. Shake off excess powder and heat with embossing heat tool. Cut phrase out with slight outline and adhere onto front of hat with two foam squares. 5. Punch 1/8″ holes at side of hat and thread approximately 24″ of black ribbon through holes. Knot ribbon at both ends with knots on inside of hat. Place on head and pull knots downward to tighten (F). 6. To add sparkle, stick adhesive gems all over surface of hat, including brads as pictured. Love this blog for great inspiration!! Keep it coming b/c I love paper source and love to get great ideas to make creative projects. Thanks for the tutorial! This looks easy and fun to make! Will be sharing with my readers! I want to make these for birthday parties too! Love this idea. You could also recycle paper that you have around the house…..great project for the kids! If you have other kid-friendly crafts tutorials, we’d love it if you would submit them. If you would like to display a featured button on your site, you can grab one from the right side bar of your post above. Thanks for a fun project idea!